Molton Brown, usually found by the sinks in five star hotels, gentlemen’s clubs and expensive restaurants, has recently launched a new collection of wash products in bright pink. The 40-year-old bath and body care brand is an icon of London luxury. Originating in Mayfair, 1973 the brand has a longstanding reputation with city slickers. 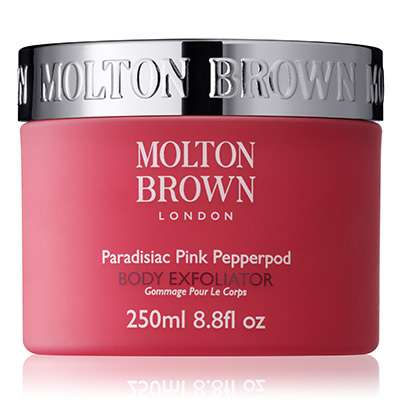 With pink packaging and pink in the name, it would seem Molton Brown is opening its shelves to a wider audience. But fear not – none of the understated sophistication is lost. Despite the cutesie name, the scent of these products isn’t as sweet as you might expect, described as ‘sultry’, ‘humid’ and ‘spicy’. It’s been created with a blend of pink pepperpod with spicy ginger and sweet patchouli undertones. Keep this 300ml squeezy bottle in your shower to impress guests. At £18 a pop, you might want to reserve it for special occasions. This Molton Brown exfoliator contains unique ingredients including bamboo stem particles and African ginger for an extra thorough all-over polish for £29. If you’re looking for some professional pamper time, why not take a look at our Body Treatment page?